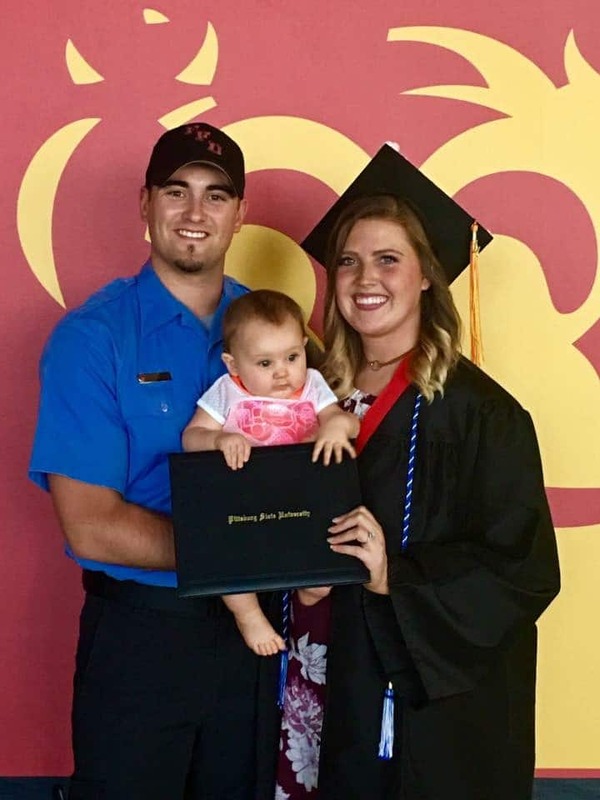 Tuesday was supposed to be an ordinary day for Pittsburg firefighter Alex Stewart and his family. Alex and his wife Taylin, a registered nurse at Freeman Health System, traveled to Joplin Tuesday morning for a staff meeting, and planned to spend the rest of the day Christmas shopping. Their trip took an unexpected turn when they witnessed a cloud of smoke on the horizon. As they drove into Riverton, the couple saw flames coming from the back window of a house and decided to stop and help. Stewart got out of his vehicle and checked the windows of the house while his wife called 911 and helped neighbors evacuate. After verifying with a neighbor that there were people living in the home, Stewart breached the front door. Upon entering the house, he found the kitchen engulfed in flames. Without any of his equipment on-hand, Stewart did the best he could to search the house. After checking the living room, he found a dog and ushered it out the front door. Once he was confident no one else was inside, Stewart exited the home and waited outside for first responders to arrive. When the local fire departments reached the house, Stewart stayed to assist them until they had enough personnel to respond to the fire. When Galena Fire Chief Bill Hall arrived on the scene, he saw Alex assisting firefighters as they tried to extinguish the fire. Hall, who leads Galena’s volunteer fire department, expressed his gratitude for the extra help. Although this was no ordinary Tuesday morning for Stewart and his wife, he says helping people is just part of who they are.